Classic Vegas themed slot games always have a vintage appeal compared to other fast paced and dynamic slot games. 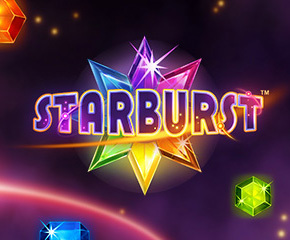 But so does outer space, and NetEnt has fused these aspects to bring forth Starburst, a game with extraordinary graphics, but with simple gameplay that makes things pretty interesting and exciting for classic slot theme lovers.The slot game is rather fast paced making you sit on the edge of your gaming throne, when you spin the reels. The game has an arcade feel to it, and its audio visuals make it pretty fun to play and rewarding at the same time. 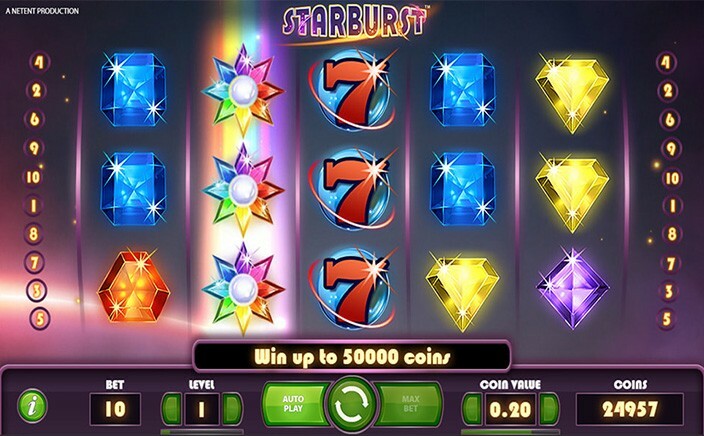 The Starburst online slots game is a 5 reel, 3 rows and 10 paylines game from NetEnt. Each payline can be played on from just 1p to £ 10, which means the game can be played between just 10p per spin to £ 100. The game offers some really good returns though it has limited features, and keeping things this simple is the reason why this game is one of NetEnt’s most played games. Starburst just has one special symbol for the whole game which is the wild symbol. This symbol however is not a simple conventional symbol substituting wild and has a number of additional perks to it. With no scatter symbols in the game, the wild symbol substitutes for all other symbols. The wild symbol appears on all 5 reels, but when it comes on reels 2,3 and 4 it acts as an expanding wild. Here the wild symbol expands to cover the entire reel, which means you just need matching symbols in the other 4 reels to get big wins. But the best part is that the absence of the scatter symbol is hardly felt, because the wilds also trigger free spins, in the form of rewarding respins. To tap into this bonus all you need to do is get a wild in one of the three central reels. Not only will the wild expand, but it also triggers a re spin. If you get another wild in the re spin, it expands too and gives you yet another re spin and so on until you get no wilds from a re spin. Starburst might be a game which has very little to offer in terms of features, but that is no reason to put it off as a game that does not reward wel. The game has a 96% RTP and returns close to 250 times the stake amount on an average to players. The base game returns are more frequent and dependable than the bonus game returns. The game has a jackpot that can give you £ 50,000 when played for max bets.